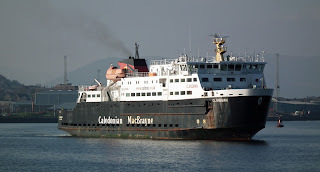 Caledonian Macbrayne's Argyle on service 22 February 2103. Tug Hellas in the background, outbound after delivering the damaged Ro-PAX Finnarrow at Greenock for repair. Isle of Cumbrae at Rhubodach on the Colintraive service 22 February 2013. Jura ferry Eilan Dhiura, operated by ASP Ship Management Ltd on behalf of Argyll & Bute Council, leaves Ardmaleish after annual maintenance 22 February 2013. 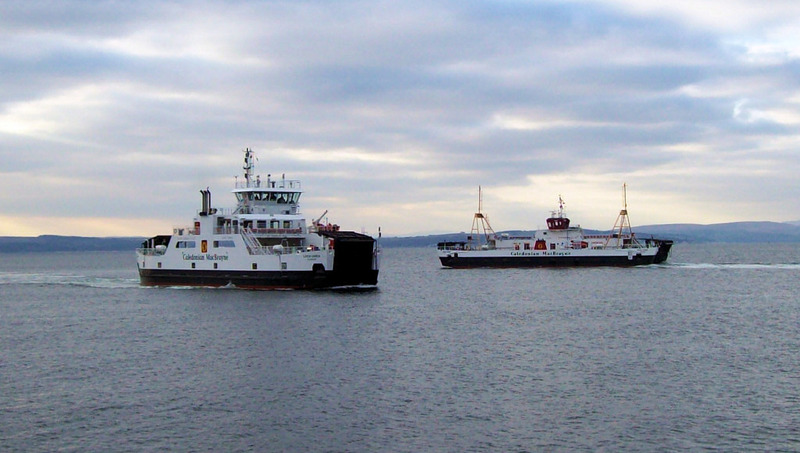 Caledonian Macbrayne's Loch Fyne starts the long run home to Mull, leaving Largs for Campbeltown 21 February 2013. Loch Fyne, removed from Garvel to allow Clansman's entry, completes annual overhaul in JWD 18 February 2013. 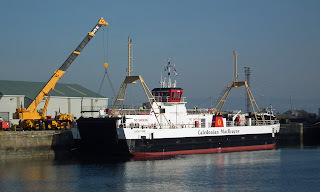 Caledonian Macbrayne's Clansman approaching Garvel Drydock 18 February 2013. The Master didn't seem happy on his approach as it took some twenty minutes to get from here into the Garvel! Brazilian patrol craft NPaOc Apa (ex Scarborough), built by BAE, back on the Clyde 18 February 2013. Caledonian Macbrayne's spare major vessel, Isle of Arran, heads for drydock at Garvel, Troon 17 February 2013.